In order to properly play and fully enjoy modern PC titles, a gamer needs a powerful rig. A fast multi-core CPU, ample RAM, and plenty of GPU power are necessary for the full experience. Sometimes, even dual graphics cards might be required. All those GB and GHz required a lot of power to run properly. What’s more, they need a reliable and stable power supply unit. Here are the top candidates for your consideration as the best power supply for gaming PC. At the time of its release, the CX750M was the second in command in the CX-M series behind the CX850M. The entire series was upgraded in 2015 with significant improvements in power output and temperature ratings. The CX750M and CX850M feature a specially developed platform that’s slightly different than the more affordable CXM power supplies. As indicated by the M designation, CX750M is a semi-modular PS unit with only two native cables – EPS and ATX. It is available in fully modular options and with more native cables. Starting off with the fan, the CX750M features a 140mm Yate Loon unit. That is 20mm bigger than the CX650 and on par with the CX850. The fan boasts a low-noise operation and is quite efficient even at the highest workloads. It is a sleeve-bearing fan that lacks the semi-passive mode. In terms of protection, the CX750M is not exactly stellar. It doesn’t have over-current protection for the +12V rail. However, Corsair claims the PSU has over-temperature protection, as well as over voltage, over power, under voltage, and short circuit. The front side of the unit sports the power supply jack and the on/off power switch huddled to one side. See-thru honeycomb grills cover the remainder of the chassis. The sides bear the company logo and the model name. The back side of the unit features two fully sleeved native cables with six additional connectors. The connectors include a pair of dedicated PCIe sockets and the rest are dedicated to peripherals and SATA. The provided cables are of sufficient length and shouldn’t cause any inconveniences during installation. The unit delivers a maximum power of 750W of power, enough to comfortably supply all except the most outrageous configurations out there. It only works in the 12V mode and has active PFC (power factor correction). The CX750M is rated at bronze 80 Plus efficiency and temperatures from 0° to 40°C at continuous full load. 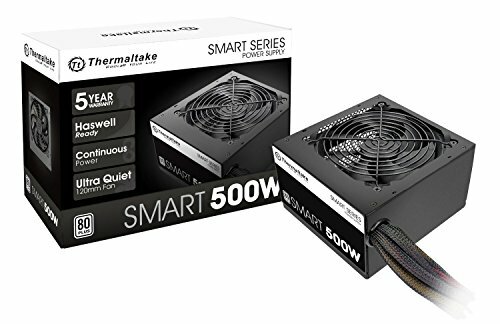 The Smart 500W is part of Thermaltake’s popular Smart series. It is the second smallest in the series above the Smart 430W and under the Smart 600W and Smart 700W. Back in 2018, Thermaltake also released programmable RGB lighting versions of the Smart series, which have the same technical specs as the standard power supplies. The Smart 500W is intended for gamers running modern intermediate-class rigs that don’t need a nuclear power reactor in the back. That being said, older and less energy-efficient rigs might not benefit from this little PSU. The Smart 500W is a non-modular power supply unit, a feature that might discourage some of the builders out there. However, the variety of cables provided is versatile enough for most intermediate builds. The cables include one 20+4 main power cord, five SATA connectors, two 6 + 2 PCIe cables, four Molex cables, one floppy disk adapter, as well as one ATX 12V cable with 4 + 4 pins. If you opt for this PSU, make sure your graphics card is ok with the 8 PCIe inputs. This PSU has a single +12V rail and can deliver a continuous 500w output at 40 degrees Celsius. Thanks to the +12V rail, it is compatible with the vast majority of modern PCs. The PSU is certified for 100,000 working hours. In terms of efficiency, the Smart 500W is rated at 80 PLUS efficiency but without the Bronze certification. The actual rate hovers between 82% and 86%. The input current is 8A max, while the input AC frequency can be 50Hz or 60Hz (it’s 60Hz in the US). Moreover, this affordable PSU has active PFC. There’s a 120mm fan located at the top of the casing which spins at 600 to 2,000 rpm depending on the workload. At the top speed, it generates a pretty quiet 28.1dB of noise. The Capstone 650 M is for gamers who own powerful rigs with high-end GPUs and processors. Thanks to its semi-modular construction, the Capstone 650 is able to accommodate a wide range of components. It is a great choice for builders aiming to put together a custom system. 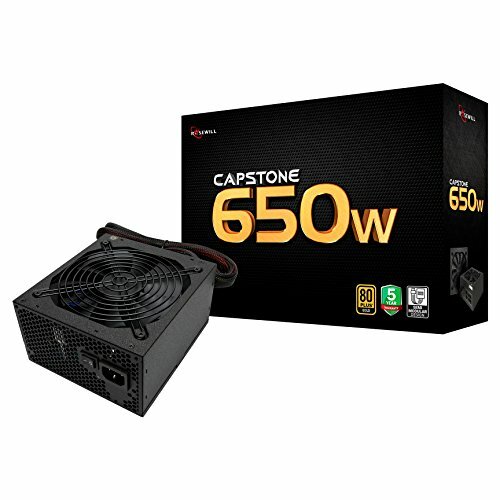 The powerful Capstone 650 sits between the standard 500/550W and the top-shelf 750/850W PSUs. It provides the said 650W of continuous power output at 50°Celsius. The input AC is universal: 100-240V at 9A max and 50Hz to 60Hz frequency. The life expectancy of the entire unit is an impressive 150,000 work hours. This PSU rocks a standard 120mm fan with a fluid dynamic bearing. The fan’s life expectancy is 50,000 at 40° Celsius. It features low noise operation and somewhat lower power consumption than standard fans of its size. The back panel of the PSU is equipped with a wide range of cables. The list includes one attached main power cable, two CPU cables (one attached, one modular), four PCIe cables (590 + 100mm cables are attached, 550 + 100m cables are modular), eight modular SATA cables, five modular peripheral cables, and one modular floppy disk drive cable. The AC power jack and the on/off power button are on the front panel. The rest of the chassis is covered in honeycomb grills. With the best power supply for gaming PC reviews and comparisons done, it’s time to move on to the final verdict. If you’re running a standard commercial rig and don’t plan on expanding it significantly, the affordable Smart 500W by Thermaltake might be your best choice. The PSU comes with a silent 120mm fan, great durability, and stable power delivery. If you’re building a true gaming beast capable of tackling 4K graphics at high frame rates, you’ll need a lot of juice. 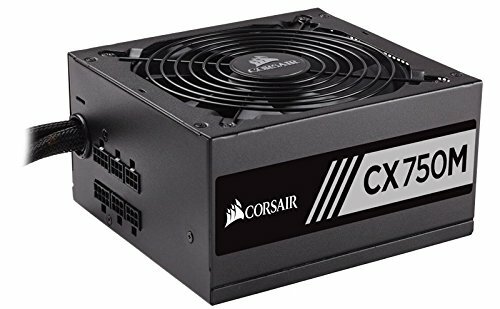 The Corsair CX750M semi-modular PSU might be your safest bet. The unit offers exceptional build quality, reliability, and power. 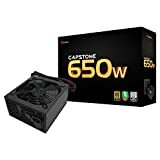 In case your build needs something in between, you might want to check out the Rosewill Capstone 650 W. It boasts a semi-modular construction, 120mm fan, and 80 PLUS Gold efficiency rating.